Crazy Rich Asians has been hailed as a possible game-changer, being the first Hollywood movie in 25 years to feature a predominantly Asian cast. As a harbinger of a more-inclusive future, though, I’d rather look to a smaller film called Searching. Directed and co-written by Aneesh Chaganty, it’s the story of a widowed father desperately trying to learn why his teenage daughter has suddenly disappeared. This new entry is unusual for two reasons. First, the plot unfolds almost entirely on computer screens as the dad searches the girl’s social-media outlets for clues. And second, the dad is an Asian-American named David Kim (played by Star Trek’s John Cho). The offbeat casting seems almost as revolutionary as the offbeat filmmaking. David is depicted as a man who mourns his late wife (Sara Sohn)—whose death to cancer is recalled in the early moments—and as a loving but imperfect parent to their daughter, Margot (Michelle La). Since David’s ethnicity plays no role in the story, the producers could have followed Hollywood’s natural tendency and cast a white actor in the lead, but they instead cast the Korean-born Cho. Coming three years after the original Oscars So White protests, that seems like progress. There’s another reason I prefer to place my harbinger hopes in Searching rather than Crazy Rich Asians: To me, it’s a more satisfying film. It’s also a more American film. 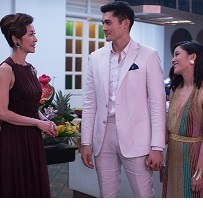 Though the heroine in Crazy Rich Asians is a New Yorker named Rachel Chu (Fresh Off the Boat’s Constance Wu), the bulk of the characters live in Singapore. That’s where are Rachel’s boyfriend, Nick (Henry Golding), takes her to attend a friend’s wedding and to meet his unexpectedly wealthy family. And though the film is ostensibly a rom-com, the central couple is too bland to make us really care about the inevitable speed bumps they encounter, including the animosity Rachel faces from Nick’s mother (Michelle Yeoh). Besides, the flick’s most romantic relationship seems to exist between Singapore and director Jon M. Chu, who photographs the city’s gleaming buildings and social scene with loving care. There are other problems, such as a too-big cast of characters, probably the result of adapting the story from Kevin Kwan’s best-selling novel. Funny actors such as Ken Jeong and Awkwafina earn occasional chuckles, but they mostly get lost in the multitude, not to mention the garishly overwhelming scenes of upper-crust decadence. Crazy Rich Asians is great as a travelogue or as a Singapore-set episode of The Lifestyles of the Rich and Famous, but as a rom-com, it’s a less than stellar. As for Searching, it also has its faults, especially Debra Messing’s not-quite-convincing turn as the police detective assigned to search for the missing girl. But the pluses outweigh the minuses. Cho’s David is believable as a father dealing with both fear and guilt as he realizes he doesn’t know his daughter as well as he thought he did. The first big shock comes from learning Margot has had more of a relationship with strangers she met online than with her classmates. But just who are these strangers? The struggle to find out leads him through a series of revelations and blind alleys. Meanwhile, brother Peter (Joseph Lee) tries to offer solace while hinting that David’s relationship with Margot isn’t as close it could be. But the strait-laced David is too busy disapproving of his sibling’s pot-loving ways to pay attention. Though it would seem to be limiting, the film’s reliance on computer images—along with surveillance footage and TV news reports—proves to be an ingenious way of telling a story. It sometimes yields affecting moments, as when David revisits home videos of his late wife and younger versions of Margot. At other times, it’s easy to relate as David repeatedly types pointed questions and responses to Margot and others, only to think better of it and replace them with safer messages. We’ve all been there. Far more than a gimmick, the film’s approach reflects the fact that all of us—whatever our ethnicity—increasingly deal with the world through our electronic devices. As the thriller illustrates, it’s up to us to determine whether they serve as our downfall or our salvation. Crazy Rich Asians is playing at theaters nationwide. Searching opened Aug. 31 at the Gateway Film Center. Both are rated PG-13.